U.S. officials seeking a China trade deal are focused on long-term changes to that nation's economy. But President Donald Trump is set on reducing the trade deficit. He is pushing his negotiators to get China to agree to purchase more goods, according to two people briefed on discussions. U.S. officials seeking a China trade deal are focused on long-term changes to that nation's economy. But President Donald Trump is set on reducing the trade deficit, and is pushing his negotiators to get China to agree to purchase more goods, according to two people briefed on discussions. China has offered to purchase up to $1.2 trillion in U.S. energy, agriculture and aircraft products over a period of six years. When the offer was first reported — a month and a half after it was discussed by Trump and President Xi Jinping at the G20 in Buenos Aires — the market jumped, a signal that investors viewed the offer as a substantial bargaining chip to win over the president. But Trump has long wanted a number "double or triple" China's $1.2 trillion proposal, these people said, requesting anonymity due to the sensitive nature of the discussions. He renewed his desire for a larger purchase deal in recent weeks, they said, following data that revealed the U.S.-China trade gap was widening. In 2018, the U.S. posted a record $891 billion trade deficit in merchandise, according to figures released March 6 by the Bureau of Economic Analysis. 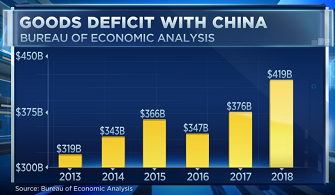 The goods deficit with China — the portion of that metric of most importance to Trump and his China hawks — reached a record $419 billion. The data showed a sharp decrease in China's import of U.S. goods in the fourth quarter as trade tensions escalated. Closing the trade deficit was a pillar of Trump's 2016 campaign and a promise he wants to keep before he enters re-election season. Rep. Steny Hoyer, the No.2 House Democrat, seized on the data, saying Trump "flunked the test he set for himself." A White House official declined to comment. The worry, two sources said, is that a ballooning trade deficit would dwarf even a trillion-dollar investment that's spread over a number of years. But assembling an exponentially larger proposal would face challenges. Brad Setser, senior fellow for international economics at the Council on Foreign Relations, said China could boost the total figure in its offer if it further opened up its market to U.S. pork, beef, rice or corn, where there's already existing demand. But unless China dramatically and permanently shifts its sourcing of goods, or repackages previously disclosed orders, it would be "impossible" to reach a figure in the trillions. "It's a little hard to see how you get big numbers with honest accounting," Setser said. Further complicating any purchase offer is the limit to the items that could potentially be included. Boeing jets are the biggest-ticket items the Chinese could add, but China's appetite to buy more has stalled with the global grounding of the 737 Max 8 and 9 jets. And while China wants to buy more semiconductors and advanced technology, U.S. officials have raised security concerns about allowing them to do so. "If China's not able to buy more Boeing jets — and China's not allowed to buy sensitive technology and defense products — there's not a lot of room to increase the preferred shopping list," said Gene Ma, head of China Research at the Institute of International Finance. Trump's advisors have sought to steer his focus in negotiations to the long-term, or so-called structural, change issues in China's economy that must be fixed to rebalance the trading relationship going forward. In congressional testimony, television interviews and briefings with reporters, they've consistently said no deal will happen without sustainable, enforceable changes. Chinese officials have continued to propose offers that play to Trump's deficit desires. Sitting across from Trump in the Oval Office in late January, Vice Premier Liu He announced that China would buy 5 million metric tons of soybeans — an announcement that U.S. Trade Representative Robert Lighthizer later told reporters took him by surprise. "The answer is yes — it was a surprise announcement, in the sense that I didn't know about it until a very short time before," Lighthizer said on Jan. 31. In a hearing before the House Ways and Means Committee a month later, Lighthizer talked about the views of Chinese Americans on existing tensions, and the areas where they agree with his own personal stance on talks. "I have found that Chinese Americans ... will say, 'Hang tough, we need structural change, this is the only way we are going to get structural change,'" Lighthizer told lawmakers. "'Don't cave; don't sell out for soybeans.'" Correction: An earlier version of this story misstated the U.S. trade deficit with China in 2018. The trade deficit in goods was $419 billion.